Last school year, when Muffin and Squeaker were two years old, we enrolled them in a playgroup that comprised six two-year-olds. 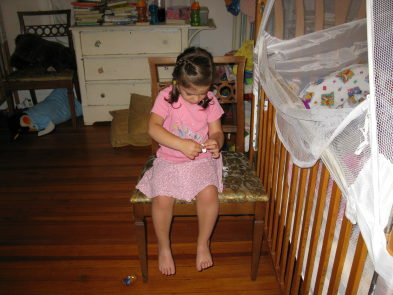 While they loved the playgroup, many mornings Muffin would resist getting ready to go, as she wanted to stay home with our beloved babysitter and didn’t want to be separated from her. However, as soon as she arrived at the playgroup, Muffin threw herself wholeheartedly into the activities, sometimes not even waiting to say goodbye before plunging in. She and Squeaker both thrived in the playgroup, making friends that she still asks about now that they are no longer in the same preschool program. And Muffin became a leader of the children in the playgroup, with all the other kids jockeying to sit near her at snack and lunch time. When Muffin and Squeaker started at preschool this September, we anticipated a similar dynamic. And when we visited the school for the orientation days, Muffin really seemed to be interested in the activities, while Squeaker, true to her nature, held back, waiting to see if Muffin thought it was a good thing to do. So we were quite surprised when, about two weeks into the school year, things changed. Suddenly, Muffin was resistant to going to school. And it was a different resistance from the previous year. Whereas for playgroup Muffin’s resistance ended at the playgroup leader’s front door, for preschool it continued at the school door and into the classroom itself. Something was clearly bothering her, but she was unwilling to tell us. When we asked her about how school was, she would spin fanciful tales about chasing tigers or she wouldn’t say anything at all. And Squeaker was not much more forthcoming, staying silent when we asked her about school. Finally, the babysitter asked Michael and me if we had talked to Muffin about school. When we said we had been unable to find out anything, the babysitter told us that Muffin had told her that one of the boys in the class had “bonked” her, or hit her. And from what our babysitter could tell, it was not a one-time accidental thing. Muffin was afraid to go to school because of this child. And when the babysitter first spoke to the teacher about the incident, the teacher’s reaction seemed to be that it was simply a case of the interactions of an active boy and a sensitive girl. While it was early in the school year and the teacher did not yet know the students as well as she might later in the year, this was a red flag to me, because “sensitive” is not the first adjective that comes to mind when I think of Muffin. She is bold and outgoing, ready to try anything at least once. And having been the target of bullying when I was in school, though not at as young an age as Muffin and Squeaker — and at a time when bullying was not treated as strictly as it is now — I did not want Muffin or Squeaker to ever fear going to school. When I had been the target of bullying, my parents spoke to the teachers and school administrators and made sure that the bullying behavior stopped. Since it was during the period of the fall Jewish holidays and there was little continuity of school attendance, Michael and I decided to give the school until the end of the Jewish holiday period to resolve the issue. One morning, we got the opportunity to address the issue head-on. The girls had had a particularly bad night, and they were extremely clingy to Michael. They did not want to let him go to work; they were afraid, they claimed, that he would go to work and not come back home. And his promising them that he would come home as he always did was not sufficient. So he agreed to accompany them to school along with our babysitter, who usually gets them there. While there, he got an opportunity to talk to the teacher and to the school administrator and to express our concerns about Muffin’s fears. And the school, to their credit, stepped up. Since then, we have not had incidents of Muffin being afraid to go to school. When we ask her about the boy, she still says that he “fights,” and she does not list him among her friends from school when we ask who she plays with, but she is not afraid of him. And Squeaker, while acknowledging that the boy bothered Muffin, does consider the boy a friend and in-school playmate. I am glad that the we and the school were able to address and resolve the issue, but I am sorry that Muffin had such a scary experience in school. While I know that it is impossible to believe that Muffin and Squeaker will never have interpersonal issues at school, I hope that they will be few and that they can be resolved in a similar manner in the future. This entry was posted in Columns and tagged Bullying, helping bullied kids, kids bullying, stopping bullies. Bookmark the permalink.